— William Harvey, 1628, British physician credited with the beginning of cardiology. He observed the motion of the cardiac chambers and the circulation of blood. The Heart Sound Recording does not only offer you to find preventative and nutritional healing solutions for your heart but also captures deeper insights about your overall health and other possible nutritional deficiencies your body might have not been revealing in other ways. Our heart is certainly the most important organ of our body, how else could it beat 100.000 times a day and keep sending 2000 gallons of blood through 60.000 miles of blood vessels daily?! Our heart is therefore also the first muscle that responds to nutritional deficiencies. Here is how one of America’s great nutritional geniuses and the heart sound recorder inventor (HSR) puts it (then called the Endocardiograph). To function optimally, it is vital that the heart receives proper nutrition to maintain its correct rate, rhythm and tone. 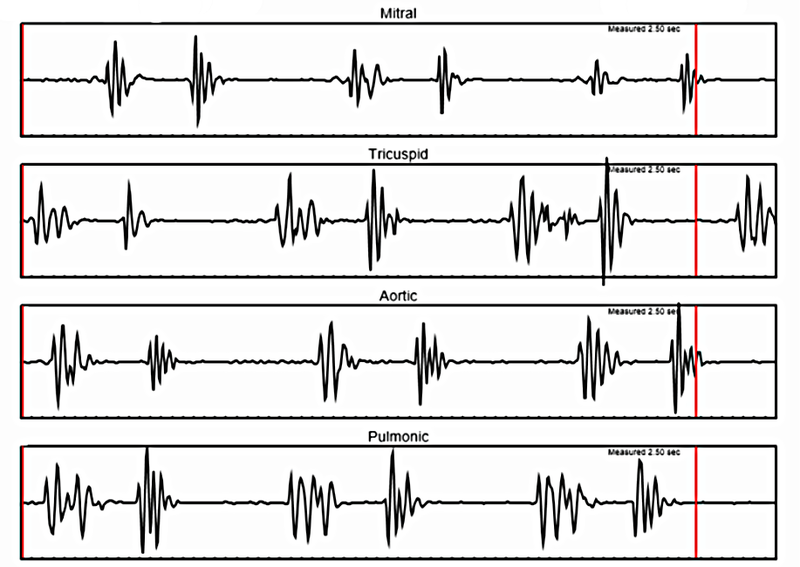 The Heart Sound Recorder can be viewed as a general wellness cardiac stress monitor with a specialized microphone that is placed over each of the four heart valves in order to graph specific heart sounds and movements. Based on the patterns we observe from the recording (like seen in the diagram below), we can create nutritional healing solutions that not only stabilize our heart but actually contribute to our whole health! Number 1 cause of death in the world today. Affects 81.1 million adult Americans (25.7% of the population), 39 million men, 42.1 million women. In the US alone 831.272 death per year (1 every 38 seconds or 2300 per day). More lethal than next seven leading causes of death combined. US Healthcare cost in 2002: 329.2 billion dollars.